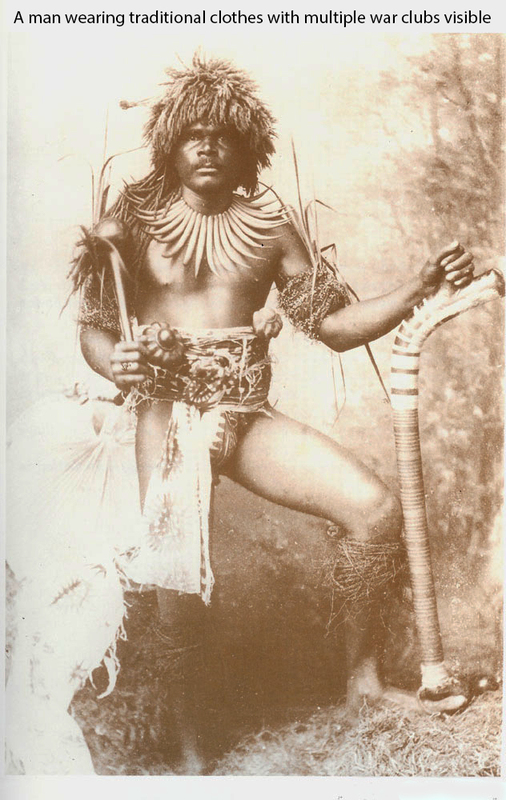 Fijian Men were fierce warriors to protect their family & clansmen from attacks from other groups. Fijian men always carried War Clubs when traveling from place to place, a large club like a Gata or Totokia were held in the hands but the warrior always had 2-3 of these shorter throwing clubs tucked into their fibre waist belt. These Ula or throwing clubs came in several different styles on the top from a spherical ball head to lobbed & the very fine gadrooned head. 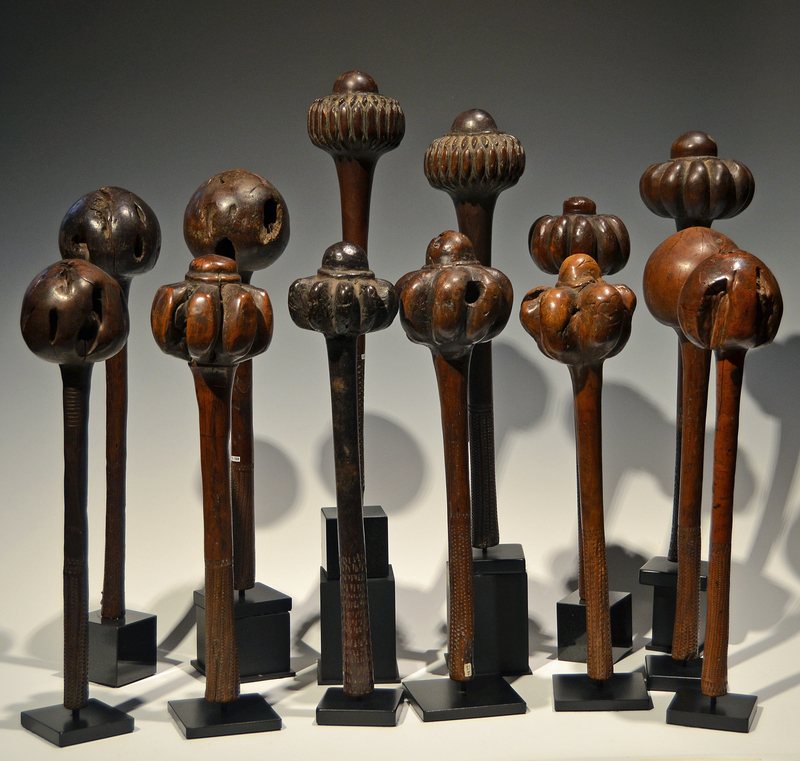 Fijian clubs were family heir looms that had great Mana or spiritual energy in them that was passed on by their ancestors. 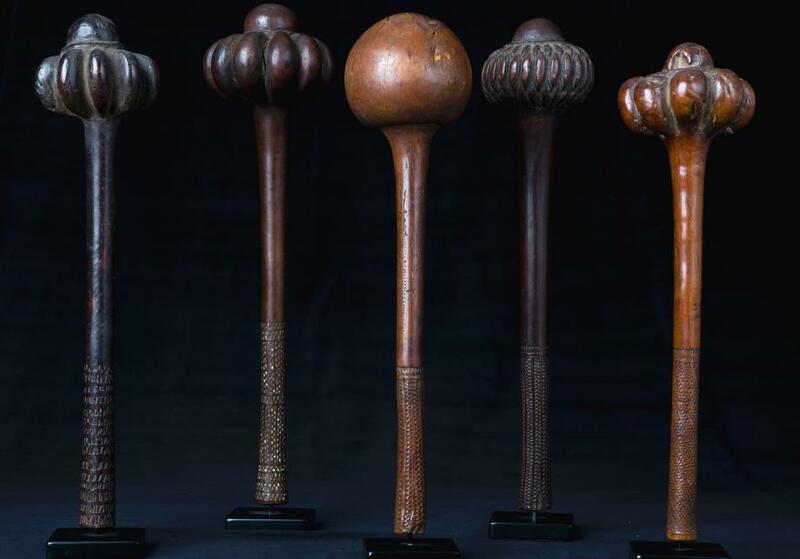 These throwing clubs always have something unique about them, sometimes counting lines or a hole where a tooth or marine ivory inlay could be added to make the club more powerful. This collection of 15 Ula throwing clubs was put together over 35 years, most of them are on custom made stands so that they can be displayed on a shelf or table. Displayed together they look like a modern sculpture instillation with all the varying sizes & head types. Some of these clubs came from important historical collections made in the 19th century. As these were collected mainly in the 19th Century it would be safe to say that some are 18th Century . Please inquire about price.